This is the weird-great Honda Puyo. 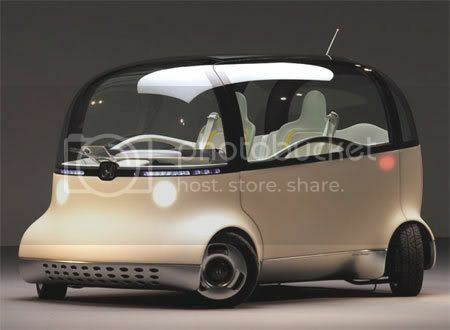 Now what little information I could find tells us that this is a concept car which runs on hydrogen fuel. Unlike the fuel-cell powered Honda FCX, The Puyo boasts "no sharp edges" and is covered in soft silicone so that it can absorb light collisions. You use a joystick instead of a steering wheel. What they forget to mention in the blurb is that you also need to be a serious Matt Groening fan to actually own of these and dare to drive it around the block. 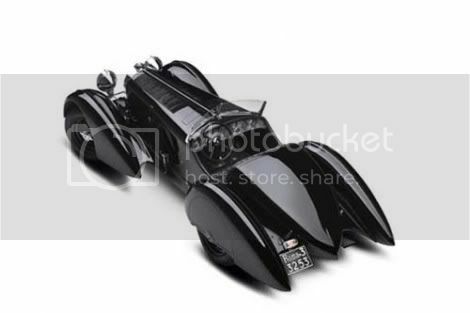 Nicknamed after the "aristocratic" Italian race-car driver Count Carlo Felice Trossi, here's the Mercedes-Benz "Count Trossi" SSK. I must confess that despite calling it a 'weird car design', this one actually is a very stylish set of wheels. To all those who always maintain that American automobile manufacturers lack innovation (OK, a gross generalization), here's GMC's hip answer: The Diesel-Electric hybrid GMC PAD. Not exactly a car but an entire home, really. Its fuel and water supplies last for weeks or even months. Its photo-voltaic cells collect sun rays during the day as the energy source. And to be even more hippie-happy, of course, the vehicle features aptly named LifeMode and DriveMode, fit for life, and then for a drive. A bit too much even for California, this pad, daddy-o? One fine day a Peugeot designer got stung by a honeybee, I think, and had a brilliant idea for a car. So he designed the Peugeot Honey-B. Like bees, it is aerodynamic, but unlike bees, it is an SUV powered by hydrogen fuel cells. Boasts seats with techno-cool hydraulic arms that help various preset adjustments - meaning they retract automatically to your preferred position once you're seated! Created by Robert Hoffman (unlikely to be made into production, as we learn), and designed for an auto magazine, this strange Nissan Moon Buggy vehicle is the direct inspiration from the Lunar Modules. 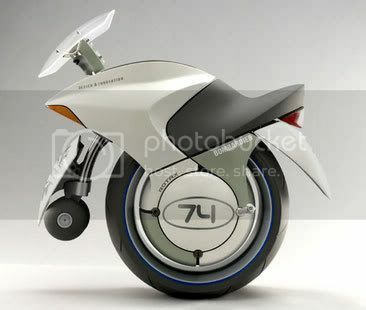 The oversize rear wheels are supposed to provide more efficiency in maneuverability. Not only that, when it reaches high speeds, Ailerons are deployed for increased aerodynamics, Ailerons are commonly found on fixed-wing aircraft! 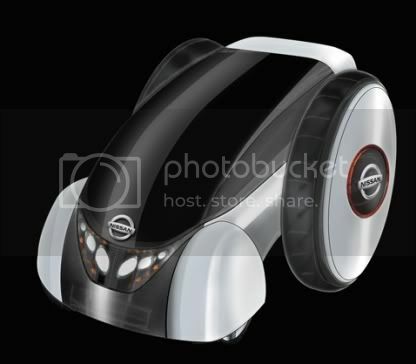 Biker chicks, biker dudes, check this "in your face" reply from Bombardier to the Segway guys: The Bombardier Embrio! 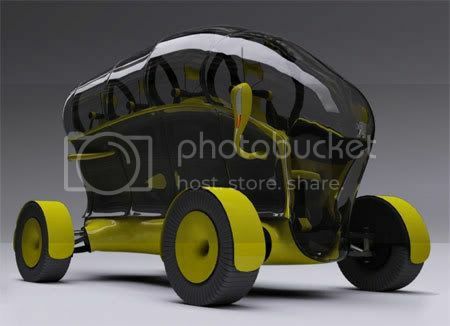 Powered hydrogen fuel cells, the Embrio's got infrared night vision and an active suspension that adjusts to road conditions, thanks to a computerized network of sensors and gyroscopes. To drive it, there's an accelerator trigger on the left handlebar, to stop it, simply use a brake trigger on the right handlebar! The Embrio is made of lightweight materials like aluminum, magnesium and nylon - weighing only 360 pounds! Who says nobody designs for gals. 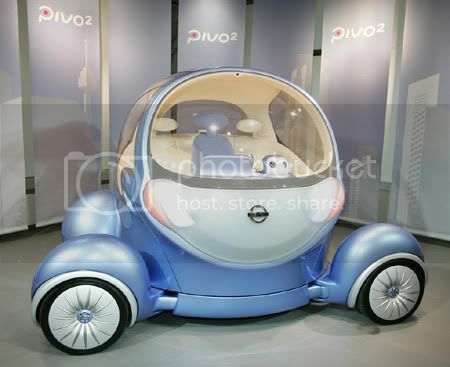 Well, not exactly just for girls but all "urbanites", get a hold of Nissan Pivo 2. It's powered by advanced Compact Lithium-ion Batteries and featuring a unique rotating cabin, which means no reverse gear required! Each of the four wheels are powered by electric motors and can turn through 90 degrees to allow Pivo 2 to drive sideways as well as forward. There settles the parking problem (again, not at all implying that women can't park!). Here's our second entry for Peugeot! 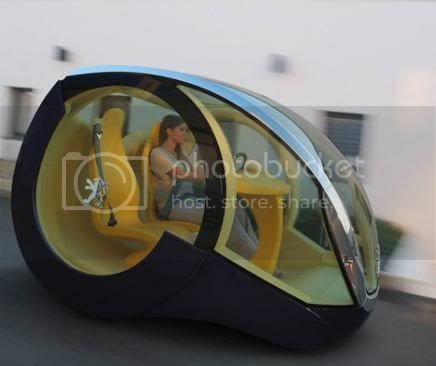 This one's called the Peugeot Moovie and designed by Portuguese designer, André Costa. The rear wheels are actually part of the doors, and have multiple functions: allowing access to the cabin and also reducing energy consumption because of its such huge set of tires. What a whale of a concept! 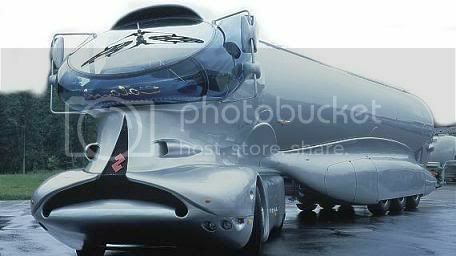 This super-cool Mercedes Colani monster is the brainchild of Swiss industrial designer Luigi Colani. Primarily crafted to improve aerodynamics, this 12.6 liter, 6-cylinder diesel behemoth features weird windshields with a central hub and a three-spoke wiper system. And flaunting their super Mercedes logo upfront with pride, who could blame them? And last but not the least, let's not forget the workmanship of old classic weird makeovers! 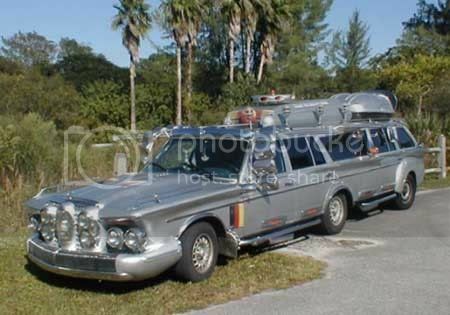 Made from 2 MB wagons and a Chrysler Imperial, this is no ordinary van! 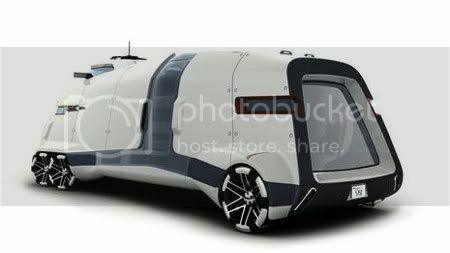 Contains a stove, microwave, freezer, TV, two air-conditioners and even a bed for two! Has been featured on at least 7 TV shows, over 20 times in newspapers and magazines including the Discovery Channel!